If you have any digital copies of old photos of the area that you would like to share with the readers of this site please get in touch with me at ilovenufcforever@yahoo.co.uk. You will retain the copyright of any images you send me. Reader Graeme Potts sent in the following photo. 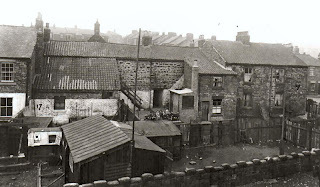 The photo shows 36 Heaton Grove (left of centre) in the early/mid 70’s. I lived there from 1960 to 1980. My dad and next door had the house walls painted, unfortunately the final colour was not the light a light shade of green wanted but quite a strong ugly one. The house was late Victorian, first occupied by a Doctor. Had stabling at the rear, evidence of the servants bells still present, and the nursery was at the top (bars to the front window can still be seen on the photo). 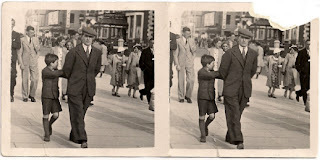 Reader Denise Morris sent in these old family photos. (Uncle) George Logan and (Aunty) Doreen Law wedding 1959 Benwell. Readerr Angus Kindley sent in the following photos. Ropery Walk, Byker taken in 1923. I believe the area is now known as Felling View. 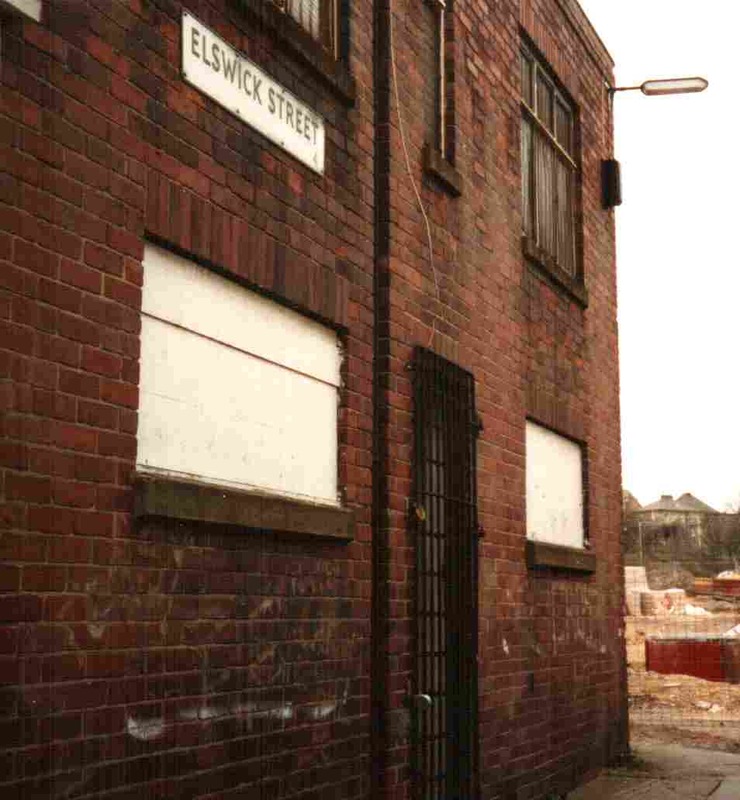 The first is Elswick Street during demolition. This photo was taken in April 1994opposite the Blue Man Pub in Elswick. 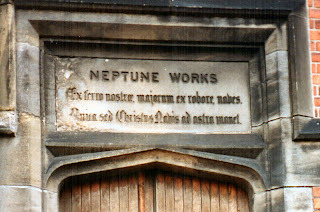 The next two photos are of the now demolished Neptune Works which was part of Swan Hunters Shipyards taken in April 1994. Reader Bob Carrick now living in the US sent this wonderful photo taken in the 1920's at Birds Nest Quarry which was down by the River Tyne. Bob's grandfather, John Carrick of Cardigan Terrace in Heaton, is on the far right. 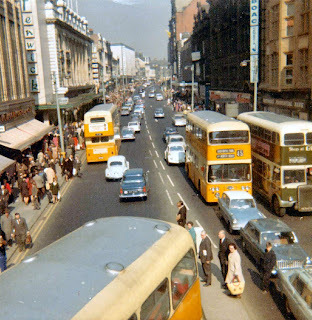 Reader Brian Collison sent in this great photo of Northumberland Street in 1969 taken with an Instamatic camera from the now removed footbridge over the road. Thanks Brian. Dianne Gibson from Canada sent some photos in of her husbands family. 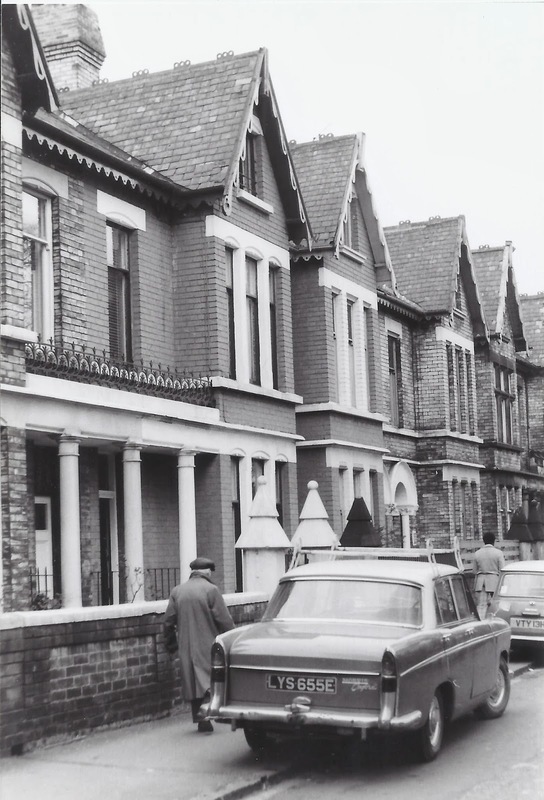 Her father in law grew up at 29 Bishop's Road, Benwell and moved to Canada after the war. 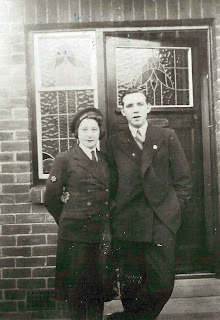 Doreen Gibson in her 'wren' uniform and cousin Bob Herron. 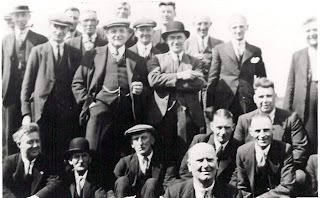 Robert T. Gibson ( centre with vest and chains ) perhaps in the 1930's. Others are unknown. Robert was a master blacksmith and ironworker - we're told that he made the ships bell for the M.S. Hood. Harry Gibson ( on rt.) with friend Bill Cole. 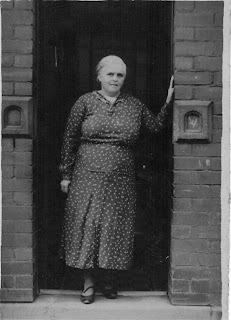 Harry's mother in window - this was taken at 29 Bishops Rd.. The Gibson's rented the home from Bill Cole's father. This is only a poor photocopy. 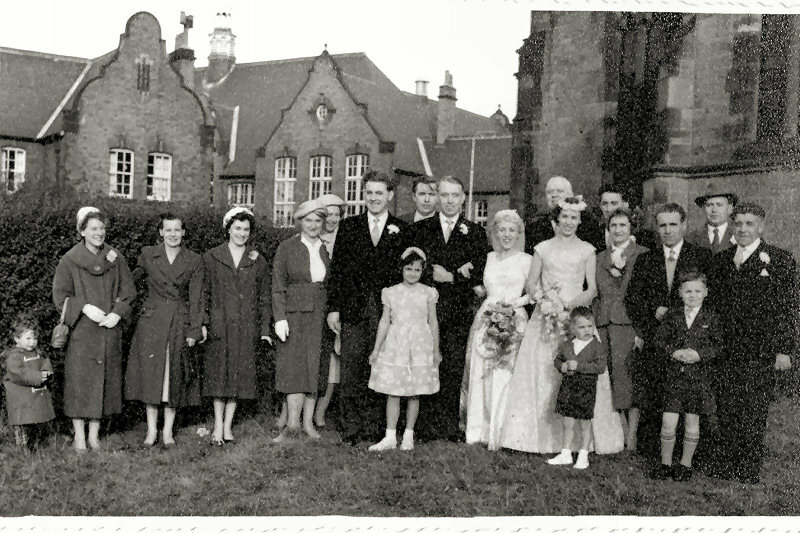 I've been trying to trace down the original photo from a cousin's family in Wolverhampton. Robert Miller, now living in Devon, sent me this photo of 1308 Walker Road. He was born there in 1941 and lived there with his family. This photo is of his grandmother standing in the doorway. 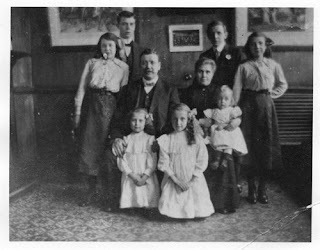 Muriel Latour, an ex-pat Geordie, now living in Canada kindly sent these photos of her family that lived in the Spital Tongues area. Muriel says My grandfather(Tot) had a house on Dunn's Terrace with a byres and farm yard with about 12 or so cows directly across on the other side of the road. It was a dairy farm and he used to graze his cows on the moor and bring them for milking (by hand) up Hunters Road! The dairy was called Stephenson Bros Dairy. The oldest photos taken, I would guess, date from around 1886 - 1888, as my grandfather is in them as a young boy and he was born in 1876. The other two are of him and his brother Joe, with one of the dairy cows and one of Joe with the horse and trap that was used to deliver the milk. Joe, Tot's brother with the Stephenson Bros. 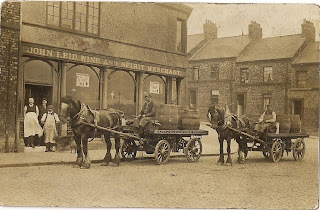 Dairy cart and horse. Uncle Bob, Aunt Margot and my grandfather Tot. 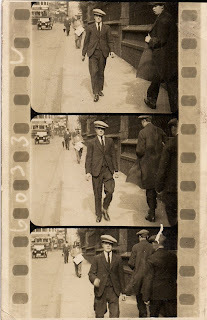 Janette Perry sent me two lots of delighful old photos to share with you all. It may take a few days to add them all. 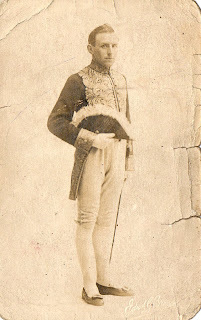 Taken in about 1915. It is of The Globe public House, Railway Street, Newcastle Upon Tyne. 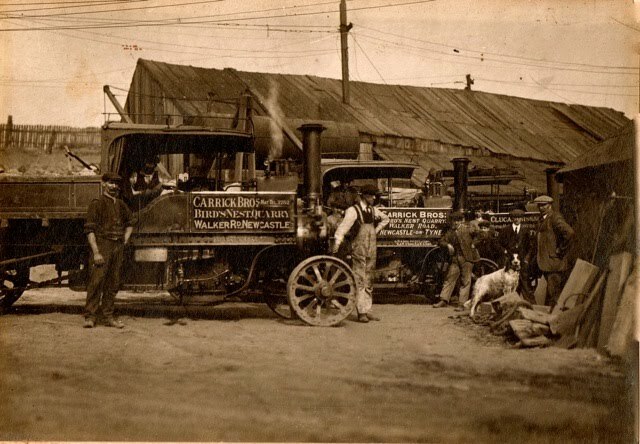 My great grandfather Anthony Malia stands on the left with his white apron on. He managed the pub for a while and he and his family lived there until he died in his forties, not long after this photo was taken. 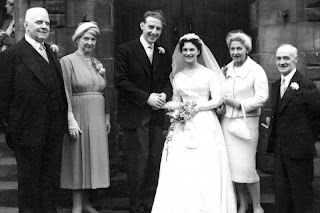 He was also a singer in his spare time and performed at the theatre in Newcastle, one of his sons Robert Malia also sang and performed and later became the choir master at St Dominics RC Church, Byker. He was there for some time. Taken around 1917 this is a photo of Margaret Malia, my grandmother, it was taken just after her father died Anthony Malia(see photo above). The family had to move house and she had to seek work elsewhere. It is in Newcastle, we don't know which pub though, just that it is one of John Reeds. She is second from right. 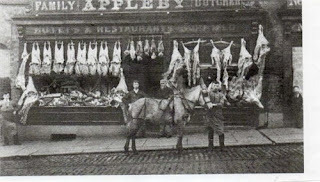 This is my great grandfathers butchers shop Applebys, at Arthurs Hill, Newcastle. He is in the middle of the picture with a beard. 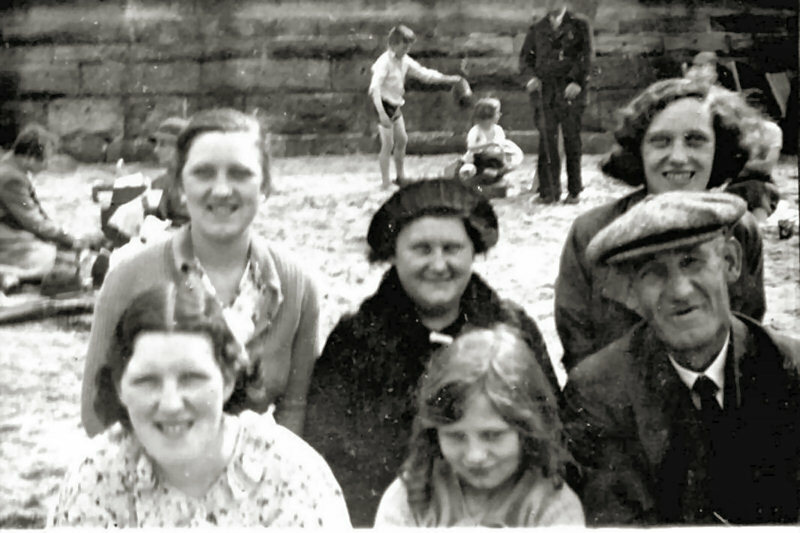 I would love to know who the other people standing next to my great grandfather are, they look like characters. 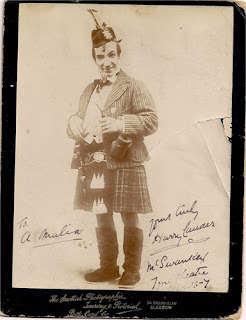 A signed photo of Harry Lauder, singer to my great Uncle Anthony Malia, in about 1907. This is my grandad. Joseph Rutherford, he was a printer in the Chronicle. this was taken nearby. 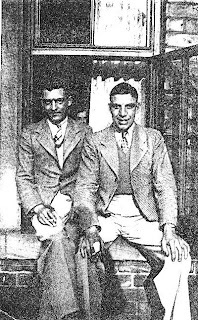 Another photo of my grandad Joseph Rutherford with my dad Joseph Rutherford junior. 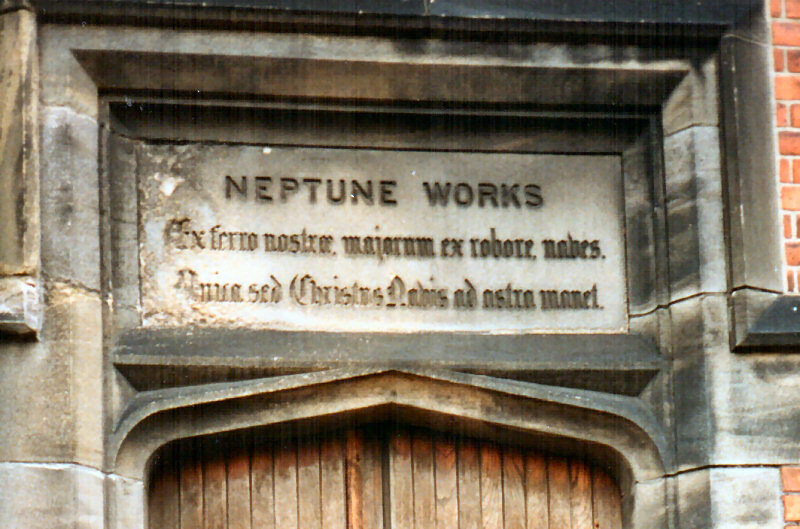 It is in Newcastle but can't make out where. The name of the hotel over the road is the Hotel Esplanade if anyone can help out with the location. My best guess is the coast somewhere but it's just a guess. 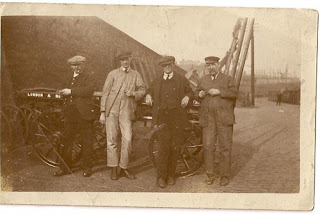 A reader added it may be Whitley Bay. This is Norah Younghusband Appleby my great Aunt, on stage in Newcastle, not a clear photo, she was quite a local celeb in her day. She is the daughter of the Butcher Appleby from the photo up the page from this one. This is Robert Malia, my geat Uncle Bobby. He was a keen singer,as was his father, he was Choirmaster at St Dominics Church for many years. 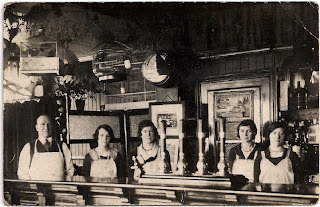 Anthony Malia and family inside The Globe pub, taken about 1910. Please get in touch if you have anything to share, thanks. I would like to contact Muriel Latour regarding photo's of Stephenson family from Spital Tongues. 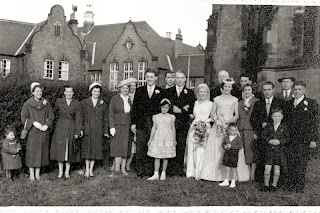 My family are also called Stephenson and lived in Spital Tongues around this time - I would be interested to see if there is a connection. Thanks, I've passed the information on to an email address I had belonging to Muriel. For Janette Perry, The Esplanade Hotel .... it may well be Whitley Bay. I too would like to contact Muriel Latour. I was born in Spital Tongues in 1947, my parents then living with my grandmother Isabella Fenwick at No.9 Claremont Road. My great grandmother (Polly Littlefair) had previously rented this property but swapped with my grandmother when her family grew. She previously lived in Morpeth Street. I too can remember my mother and grandmother talking about a Mrs Stephenson. I too should like to contact Muriel Latour. I was born in Spital Tongues in 1947 whilst my parents were living with my grandmother (Isabella Fenwick) at 9 Claremont Road. My great grandmother (Polly Littlefair) previously rented this property before swapping with my grandmother when her family increased. 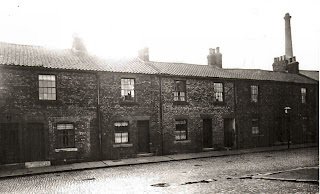 Grandmother previously lived in Morpeth Street. I remember my mother talking of a Mrs Stephenson. My email address is catsmother2@tiscali.co.uk. I'll pass your details on. Would you like me to pass this information along to Muriel? If so please leave an email address that I can pass on. any old photos of nazareth house? 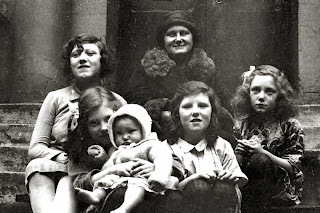 Researching my family history and saw your name and photo's wondered if we were related? 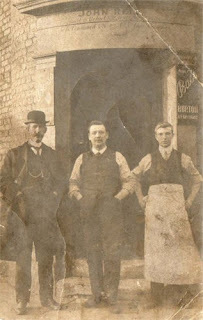 My great grandfather john henry gibson was born in newcastle 1859 to london in 1880's. I would like to contact Janette Perry re Malia family my great aunt MaryAnne was married to John Malia. I have passed your details on to Janette. Looking to contact person posting "markandemma" blogger note. Re: Stephenson's of Spital Tongues. My e-mail telit@nl.rogers.com. I am curious about Joseph Rutherford. There are no dates on the photos. I have a Joseph Rutherford in my tree born in Acomb in 1851. Any relation? 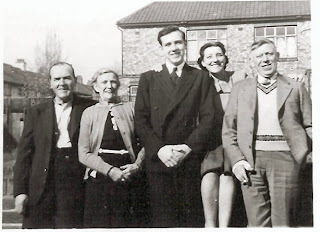 I have a similar Appleby butcher picture on my wall, my photo has 5 gentlemen on it, I believe on is my Father (Carlton Appleby) my grandfather John (seppy) Appleby and another 3 generation of Appleby men.... Dad know's who they all are. 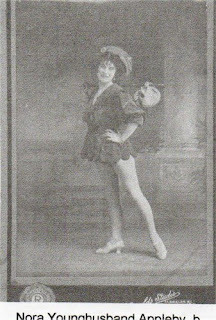 in 1918. He was posted to the K.O.Y.L.I Regiment. He died of gas poisoning 3 months after being called up. He is buried in St Stevens Cemetery in Rouen France. I have a picture of Andrew in uniform and on the back of the photo he has signed From Andrew to Mrs. Appleby in pencil. Andrew was my fathers brother. Bob Young. 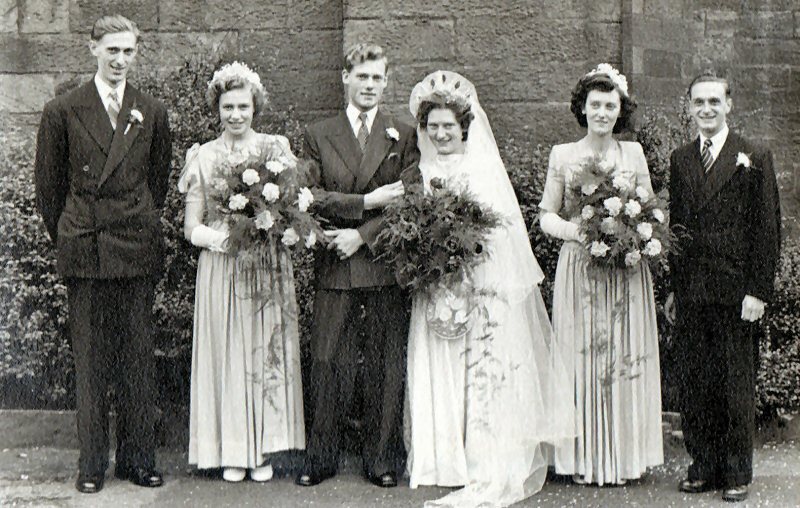 Any info on Mary miller nee hope ... Married Jack Miller , lived 13 Morpeth street , near Sunderland ( trying to see writing on back of old photo) Plz contact donnaglover@ntlworld.com..